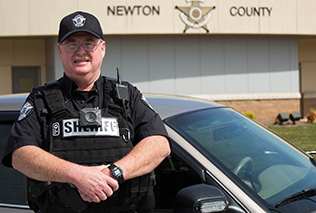 Deputies with the Newton County Sheriff's Office Warrants Division are responsible for the service of arrest warrants issued by the courts. Warrant service is accomplished regardless of the originating courts jurisdiction. Deputies assigned to the Warrant Division also cooperate with federal law enforcement agencies including participating in the U.S. Marshals service Operation Falcon, a nationwide effort to apprehend persons with felony warrants. As of this year, Newton County Sheriff's Office has joined the Southeast Regional Fugitive Task Force with the U.S. Marshals Office. The Sheriff has placed a full time Deputy to be assigned to the Marshal Service. This provides our office with a superior resource and greatly benefits the citizens of this county. IF YOU OR SOMEONE YOU KNOW IS A FUGITIVE CONTACT THE NEWTON COUNTY WARRANTS DIVISION AT (678)625-1411 OR YOU MAY UTILIZE THE ANONYMOUS TIP E-MAIL LINE ON THIS WEBSITE.